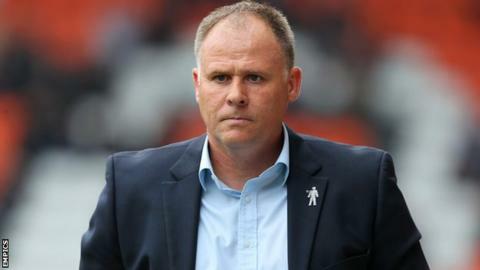 Blackpool manager Neil McDonald believes that his side are "better than where we are" in League One. The Seasiders are currently 22nd in the table and have won only one of their last eight games in all competitions. "We are where we are, but whether that's for a reason I'm not sure," McDonald told BBC Radio Lancashire. "We're not adrift, we're in the pack. One win takes us out of the bottom four, so we're competing and the games that we've lost have been very close." Blackpool have the worst goalscoring record in League One, having managed only 16 goals in 20 games so far this season. "We make sure that we stay in the games as much as we possibly can, and if we can express ourselves then we do," McDonald added. "But the position we're in at the minute says that we have to keep things tight and try to win the game by the odd goal."